A San Diego police officer — who was wounded and his partner killed by gunfire while targeting street gang activity in the Shelltown neighborhood — received the Law Enforcement Congressional Badge of Bravery from Congressman Duncan Hunter Monday. Officer Wade Irwin received the high honor as a result of his “exceptional act of bravery in the line of duty.” Nationwide, he is one of only 12 law enforcement officers to receive the award for the 2016 year. On July 28, 2016, the San Diego Police Department‘s Gang Suppression Team was conducting saturation patrols targeting street gang activity in Shelltown. Irwin and his partner Officer Jonathan DeGuzman were partnered together when a suspect opened fire on them. Irwin was struck in the neck and fell backward onto the ground next to their patrol vehicle; DeGuzman was fatally shot before he could get out of the vehicle. Lying on the ground and bleeding, Irwin was able return fire and wound the suspect. Although the shooter escaped, Irwin managed to put out a distress call that prompted a citywide search for the suspect. Approximately 40 minutes into the search, officers found the suspect in a nearby ravine. Jesse Michael Gomez, 52, was arrested and charged with murder, attempted murder and being a felon in possession of a firearm. “The actions of Officer Irwin demonstrated extraordinary bravery, decisiveness, and a willingness to save the lives of others, without regard to his own personal safety,” according to th U.S. Department of Justice. 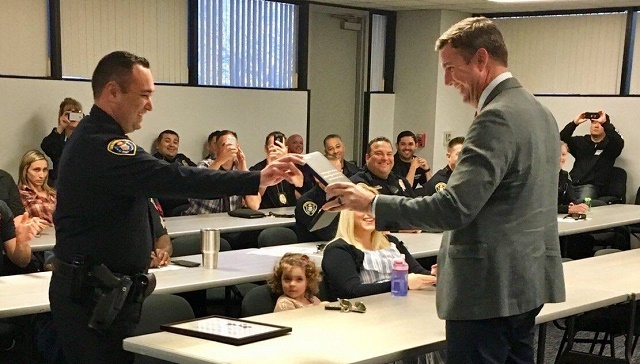 Irwin is the only California law enforcement officer honored for 2016.